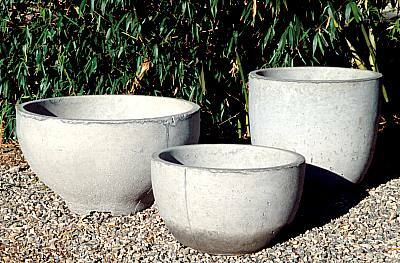 San Marcos Growers is the manufacturer of Garden Maker Concrete Planters designed by Howard Folkman. There are three sizes of these pots as pictured above with the dimensions listed below. The cement used in these planters is stabilized, making them ideal for water garden use. Pots are cast in natural cement color or in adobe. Small 16" tall by 26" diameter 12½" by 23"
Medium 24" tall by 26" diameter 22" by 23"
Large 22" tall by 36" diameter 17" by 33"